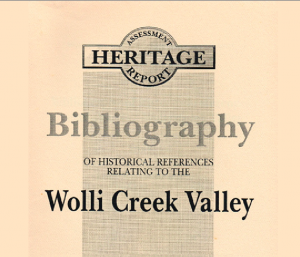 This report is an update of an archaeological survey undertaken in 1991-1992 by the Wolli Creek Preservation Society at a time when the Wolli Creek Valley was threatened by the construction of the M5E. The information gathered was used in the preparation of environmental impact assessments for the proposed motorway. The study identifies 17 sites of signiificance and 8 supplementary sites. It documents evidence of non-Indigenous occupation from the 1840s including structural remains such as walls and garden borders as well as larger landscape elements and it recommends actions to protect identified sites of significance. 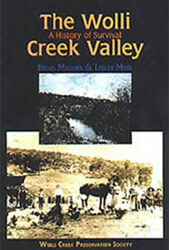 Esteeemed local historians Lesley Muir and Brian Madden were commissioned by Wolli Creek Preservation Society to prepare a bibliography of references to the Wolli Creek Valley. The bibliography includes reports, monographs, journal articles, manuscripts, maps, pictures, newspaper items, oral history and land titles. It was produced with the assistance of a grant from the Heritage Assistance Program. An updated and expanded version of the 1989 guide to birdwatching in the Wolli Creek Valley by Neil Rankin (1923-2001), ‘The Birdman of Wolli Creek’. With over 50 hectares of diverse bushland habitats, around 100 species of birds are recorded each year in inner south-west Sydney’s Wolli Creek Valley. The new edition has 80 pages with tables, maps, photographs and sketches and includes bird observation data in taxonomic order from 1940 to 1999. 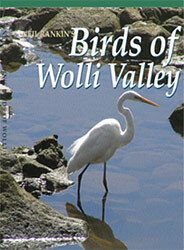 There is also an analysis of the bird species present in the valley and their frequency since 1982. The guide contains a detailed introduction to birdwatching for beginners and local residents and information about the best places to see birds. A facsimile of the original edition (with corrections) is available as a PDF to view or download. To make the history of the valley more accessible, the Society has had five videos transferred to DVD. The Battle for Nanny Goat Hill filmed by the ABC for This Day Tonight in 1967 – this struggle was one of earliest fights to protect the natural environment in urban areas, even pre-dating the famous fight for Kelly’s Bush in Hunter’s Hill. Wolli Creek Valley: Marrickville West PS /Disadvantaged Schools 1987. Total running time 51 minutes. Cost $15.00 ($10 to WCPS members) plus $2 p&p. If ordering more than one DVD or combining with other items, please contact info@wollicreek.org.au for pricing. Written by prominent local historians Brian Madden and Lesley Muir, this lavishly illustrated booklet is an excellent account of the historical evolution of the Wolli Creek Valley’s greenspace and the surrounding suburbs. It deals with the natural landscape, the traditional Aboriginal owners, pioneer European settlers, the subdivision of the land, the development of the surrounding suburbs, early public transport and infrastructure, the struggle against the proposal to route the F5 freeway (later the M5 East motorway) through the valley and much more. It includes an index and a glossary of local place names and their origin. The 41 images include portraits of early landowners, early 19th century drawings, subdivision maps, photos of the Wolli Creek Valley as it looked before extensive subdivision, early 20th century farms and infrastructure construction. The Wolli Creek Valley is formed from ancient sandstones laid down over 200 million years ago during the Triassic Period. 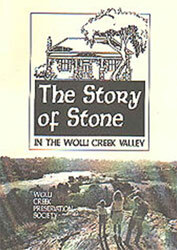 This booklet details the geological origin of the valley’s sandstone. It shows how sandstone has influenced the evolution of its ecosystems, Aboriginal life and early European quarrying and building. 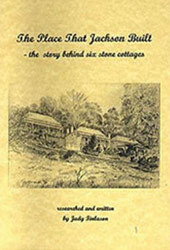 There is an extensive account of the Jackson quarry in Undercliffe and local sandstone cottages. ‘Reading sandstone’, a special section contributed by Dr P.J. Conaghan, one of the world’s leading experts on sandstone geology, contains an extensive technical account of the formation of Sydney sandstone, and of the Undercliffe ‘wave rock’, a formation which may be the world’s largest example of a recumbent cross-bed. Wolli Creek Preservation Society, 1999, A5 format booklet, 16 images, 39 pages. Foreword by Jack Mundey. This is the story of William Jackson and his wife Louisa who left their native Yorkshire and emigrated to Australia in 1884, settling in the Wolli Creek Valley in 1890. The Jacksons developed a quarry and market garden and built a unique street of six stone cottages in Undercliffe, now called Jackson Place. William Jackson became an early member of the Labor Party, the Single Tax League, the Undercliffe Progress Association and the Pig and Poultry Farmers Association.